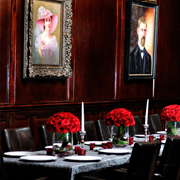 Three private dining spaces on property total 4,100 square feet of meeting and event space. Onsite catering and full service event staffing for all events by Rick's Chophouse. 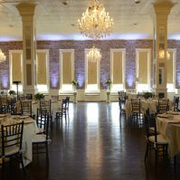 The Grand Ballroom is located on the second floor of the Grand Hotel. This breathtaking 2,500 square foot space includes crystal chandeliers, original exposed brick walls and pressed tin ceilings. It has recently undergone a renovation featuring hand scrapped hard wood floors, bench seating and antique mirrors. Accommodating up to 150 guests for a seated event, or up to 200 guests for a cocktail style reception. Rick's 110 is our private dining and meeting space with its own entrance through our lobby. This flexible space can seat 60 guests for dinner, host a cocktail style reception for 80, or accommodate 30 for a presentation style event. Rick's 110 offers privacy and elegance with floor to ceiling mahogany wood walls, climate controlled wine racks, a private restroom, a private bar, and six commissioned paintings celebrating the history of McKinney. 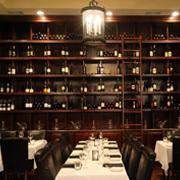 The Wine Room houses our global wine list in floor-to-ceiling oak racks. This private space is also a working wine room and can seat up to 12 for a meeting or up to 34 for a seated dinner. 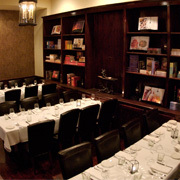 The Library surrounds you in cookbooks which are favorites from Rick’s Chophouse’s owners. This comfortable space can seat 14 guests for a meeting, or up to 28 for a seated dinner event. View the gallery for a peek at our event spaces and contact us today for a private tour.